So this past weekend we finally did something I’ve been wanting to do for a loooooong time now. We moved my beloved oversized chair upstairs to the living room! Now, I realize this may seem like a ridiculous thing to get excited about, but it’s the little things that make me happy, ok? I get overly excited about small stuff like rearranging furniture, painting all the things, and finding vintage goodies at garage sales. It’s just how I roll. 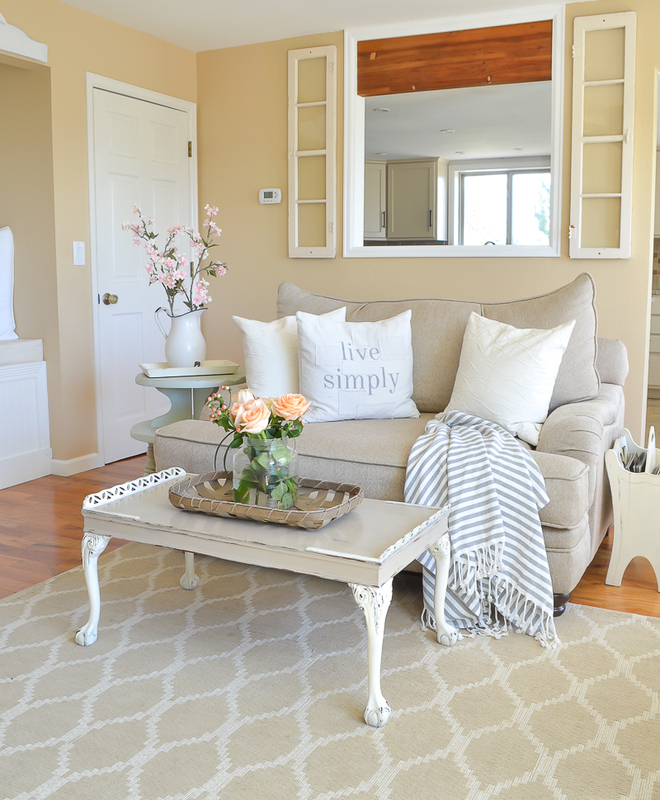 And as you can probably imagine, moving this chair inspired me to freshen up the entire room for summer–which is another thing I’ve been wanting to do lately. 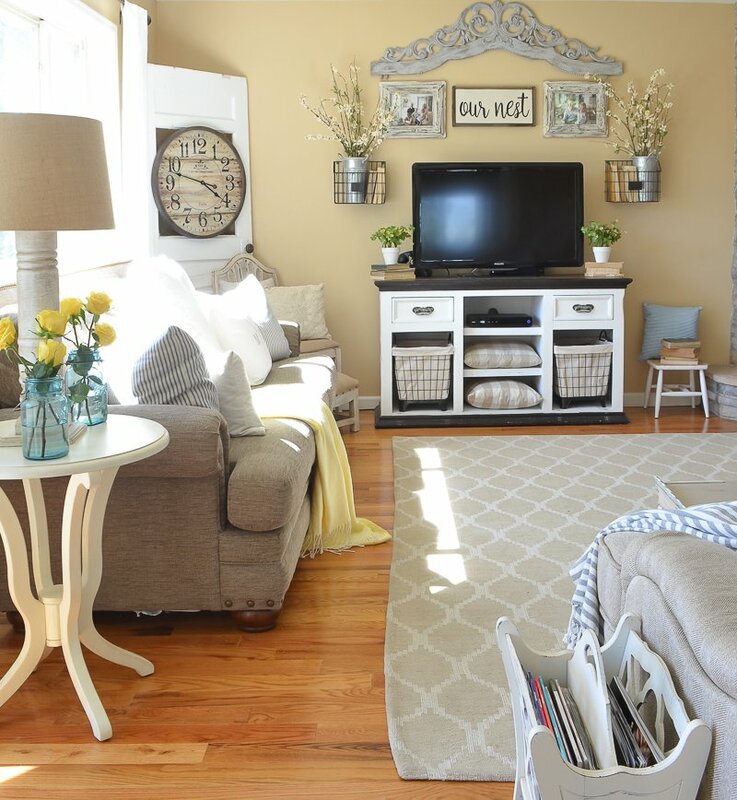 Isn’t it funny how one little change can cause a chain reaction and before you know it the entire room has a new look? That’s pretty much what happened this weekend. 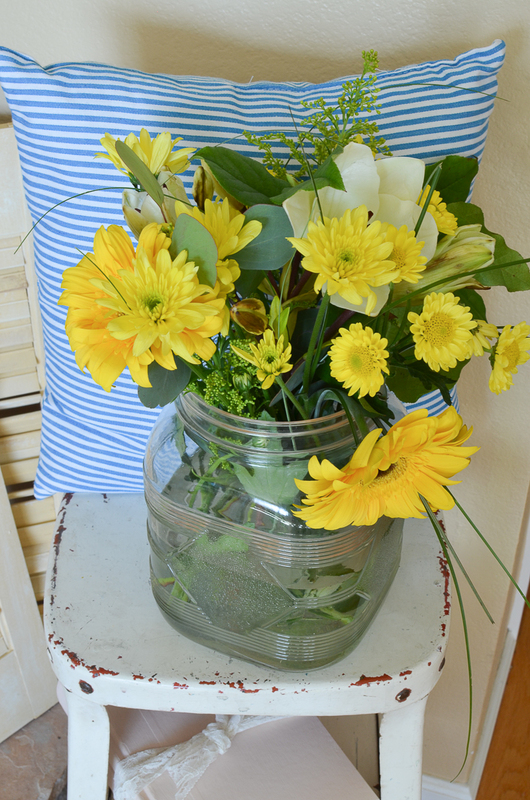 I loaded it full of fresh flowers and a few pops of color to brighten things up. 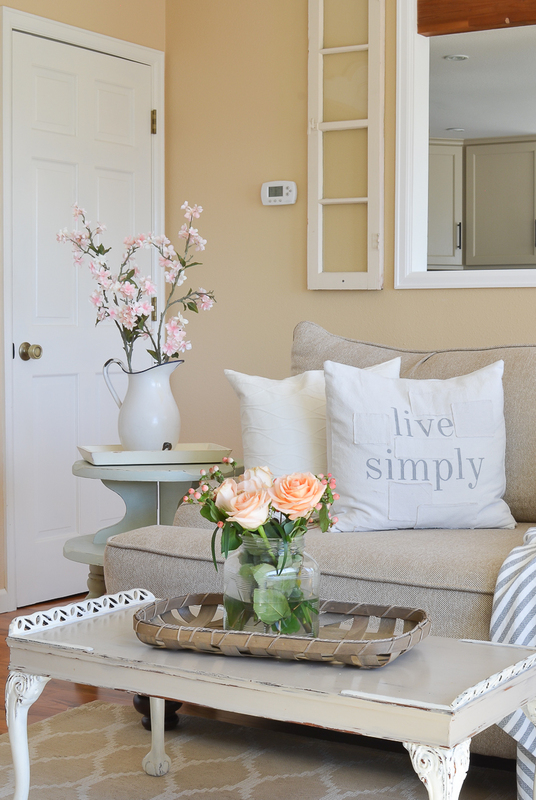 So grab your coffee or a snack and come on in for my summer inspired farmhouse living room tour! I absolutely love this chair and a half. (similar one here) It’s such a nice change over the two accent chairs we had in this spot before. And I still can’t get over the difference that passthrough into the kitchen has made in this room. Every time I walk in here I can’t help but smile and just take a second to admire how open and bright everything feels. I can’t even begin to tell you guys how relieved I am to finally have this project complete. It was worth every minute of frustration and hard work. Who knew such a small little window could make such a crazy impact? I’m kinda digging yellow and blue for summer. 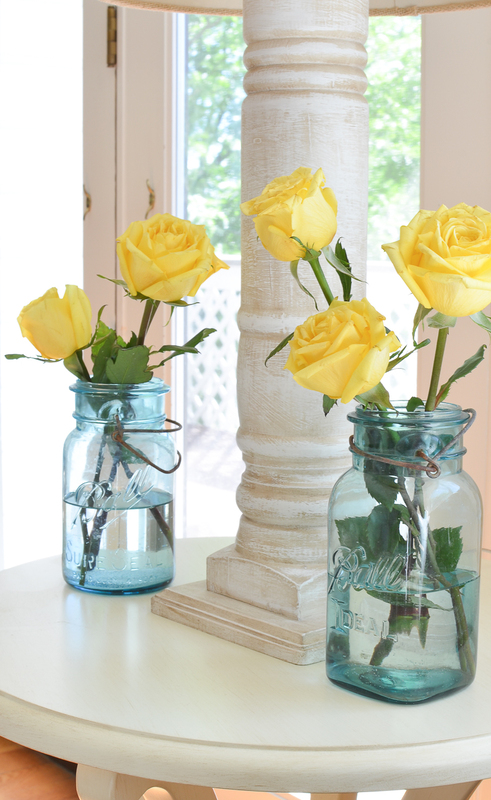 These yellow roses smell absolutely divine and I just love the way they look in these old vintage blue jars. Something about the combo is very fresh and summer-ish to me. Again with the blue and yellow. I can’t be stopped people! I actually spotted this blue striped pillow in the dollar spot at Target recently. I think it was $5, so I snagged two of them. I don’t usually use a lot of blue in our home, you guys know this, but I think it’s the perfect pop of color for summer and I’m kinda loving it. I decided to hang this quote in the reading nook for the summer because I really want to focus on slowing down and enjoying each and every day. I wanted to see this reminder every day as I sit with my morning coffee and play with the kiddos in our living room. To be honest with you guys, I’m a little sad about the fact that June is halfway over. I mean, the first month of summer is already zooming by and I just hate how fast it goes. I know that makes me sound like a crazy person to already be thinking about summer being over, but it’s true. I just wish I could slow time down. I especially want to savor each day with my little people before this new baby comes in two weeks (or less!). You know, just enjoy the time with them before things are crazy. And different. I’m obviously excited about the baby, but I’d be lying if I said I won’t miss my time with just them. I’m bad with change guys. Anyway, I’m rambling now. But I love this sign and how it reminds me to use every day for good. 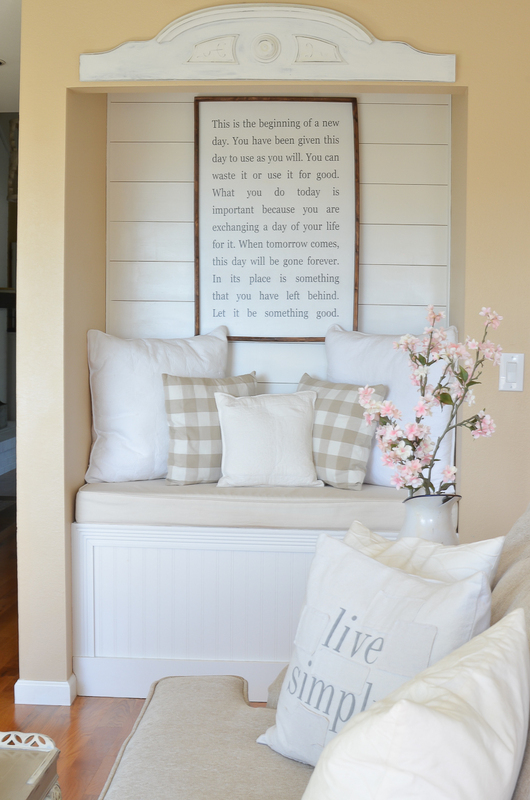 You can find tons of farmhouse style signs with this same quote on Etsy here. Yep, more flowers. I may have an teeny tiny addiction. But in my defense I actually scored these beautiful roses for just $2 in the clearance section at my local grocery store’s floral department. It only took one day in fresh water and they perked right up. Can you believe that?! 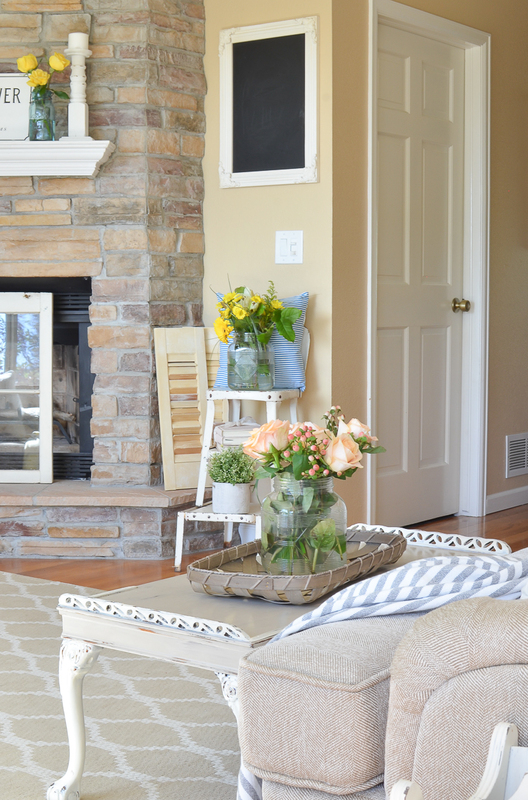 I absolutely LOOOOOOVE having fresh flowers in the house throughout spring and summer, they just add so much cheer any happiness to any room. And if you’re able to find them on sale like I do, it won’t break the bank to keep them around all the time. Definitely check the clearance spot first people! 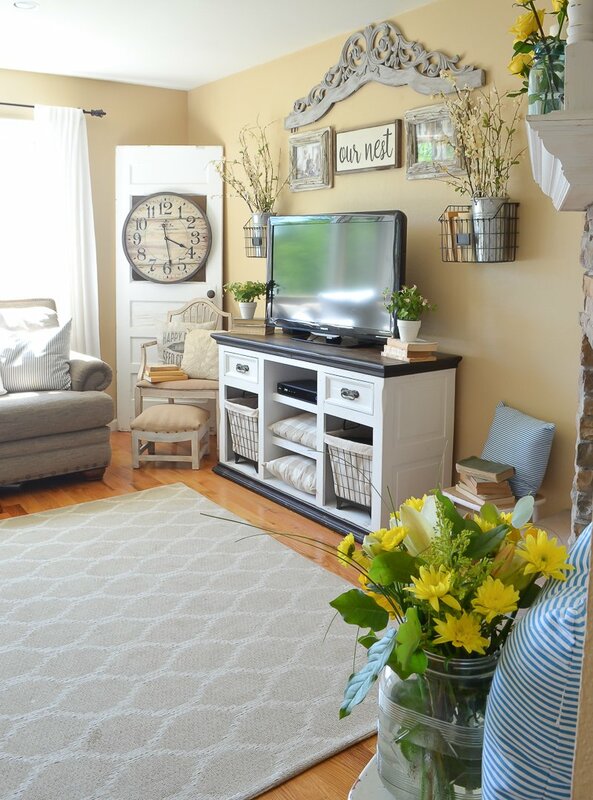 Well there ya have it–my farmhouse living room looking all fresh and perky for summa-time. 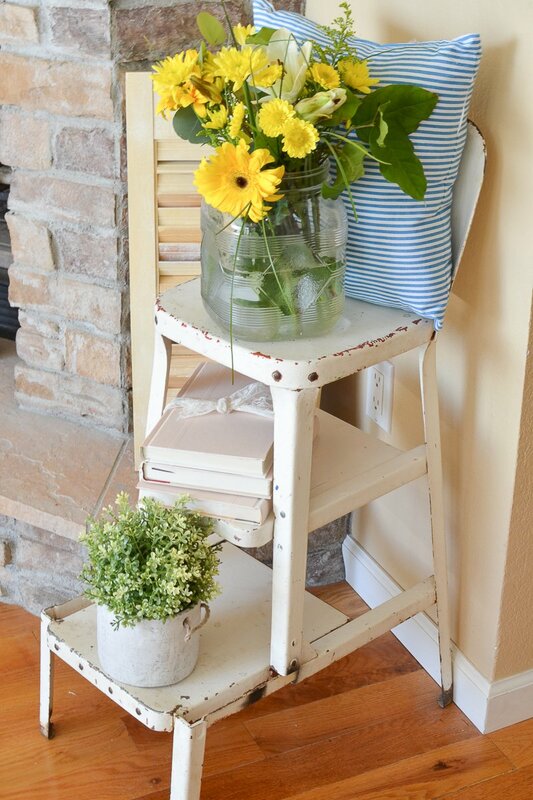 I kept this little refresh very budget friendly by shopping my house for a few decor swaps and buying all those discounted flowers. Just a few simple changes and the room has a whole new vibe. And can I say again how much I love having our oversized chair in here? It really makes the whole space feel bigger and a bit less cluttered. This is obviously a small living room, so we need all of that we can get! I’m so glad to have you drop by the blog today. I hope your Monday is off to a fabulous start and the week ahead brings you nothing but wonderful and happy things. And donuts. Donuts would be nice too. So pretty and so inviting. 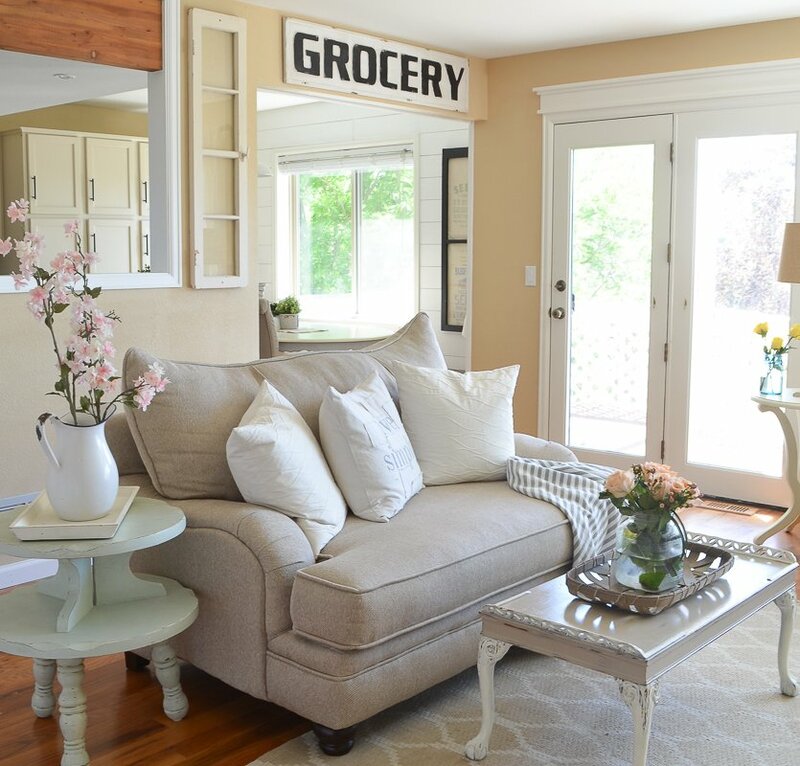 I love this post seeing how you changed your living space up for Summer! Looks perfect! 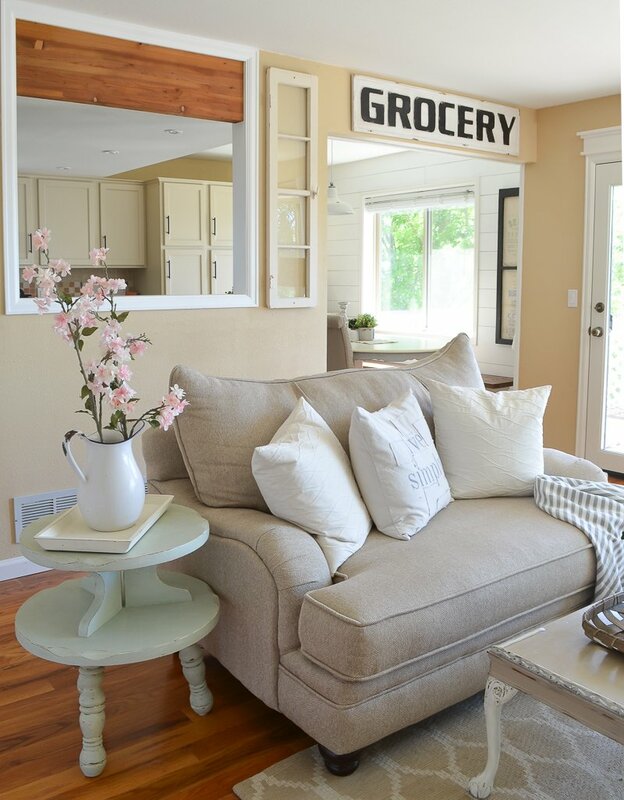 Love your decor and all the inspiration!! Glad to know that the snow finally disappeared!! Lol! I thought it was bad here in N.B. Canada for hanging around till that last snow post of yours! 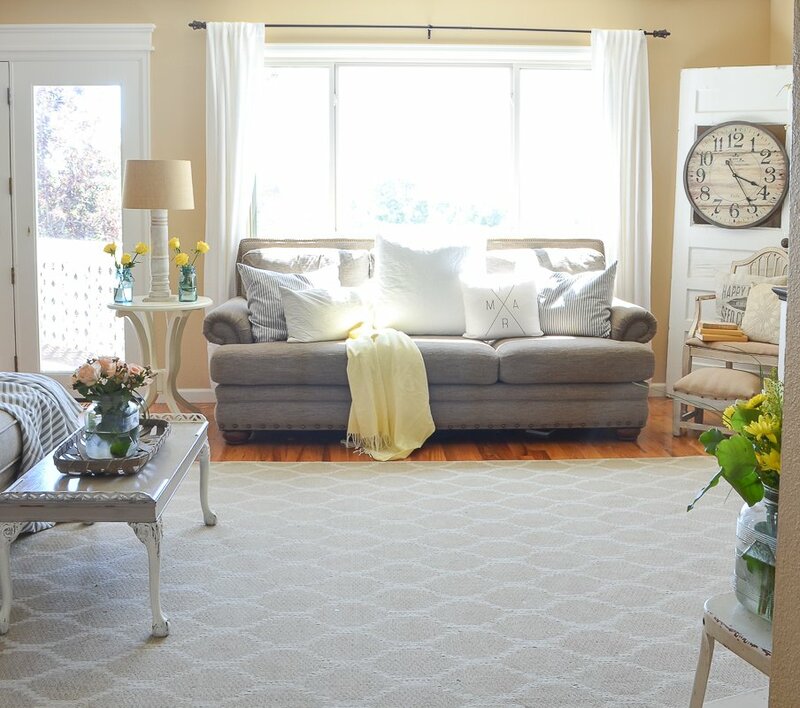 Your home looks well loved and so inviting. Like a saying says..Love lives here!!! GOD Bless you and your family..and yr new baby???? 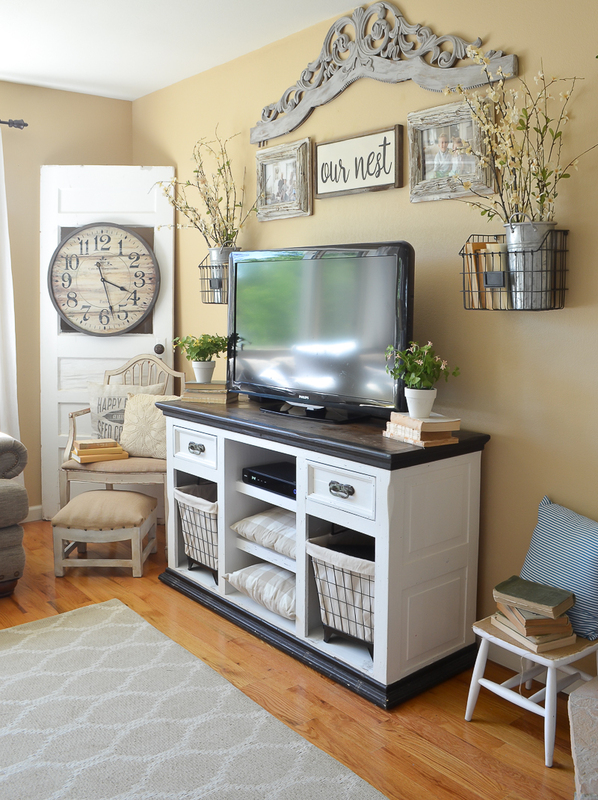 Looks really pretty….still loving that white stool! I love the coffee table with tray-like sides. Very vintage and pretty! Isn’t that unique!? I bought that coffee table from a local antique dealer. 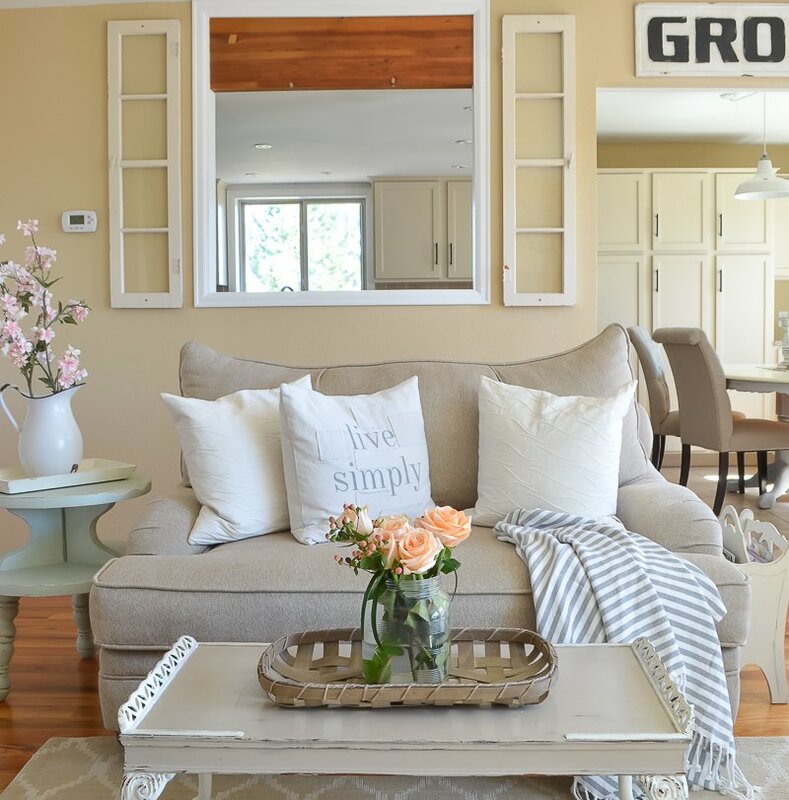 Love your home and decor!! Do you have a link on how you did your coffee table?? Thank you Anette! I wish I had info on the table, but I actually bought that from a local antique dealer. 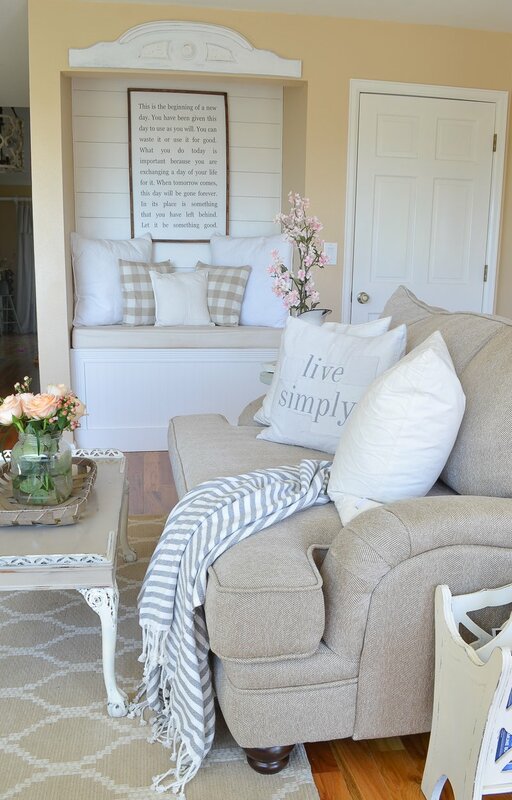 That quote looks perfect in your reading nook! And I love your little pops of color…I always want to decorate with blue accents for summer, but then I like red stuff in the fall in winter! What’s a girl to do!???? Thanks Megan! It’s fun to switch it up and add in pops of color when the seasons change. Everything is so fresh and lovely. 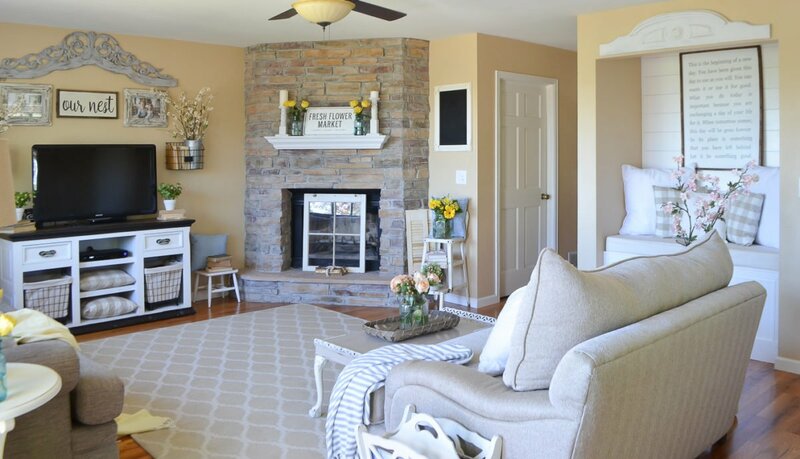 I would sit in that family room and read magazines all day and never get anything done. Simply beautiful. Looks so airy and fresh! Love it!! Everything looks amazing, I am inspired! We are still in school this week in northern Vermont, ugh! So, next week,I will officially have more time to “summer-ize” my house!!! 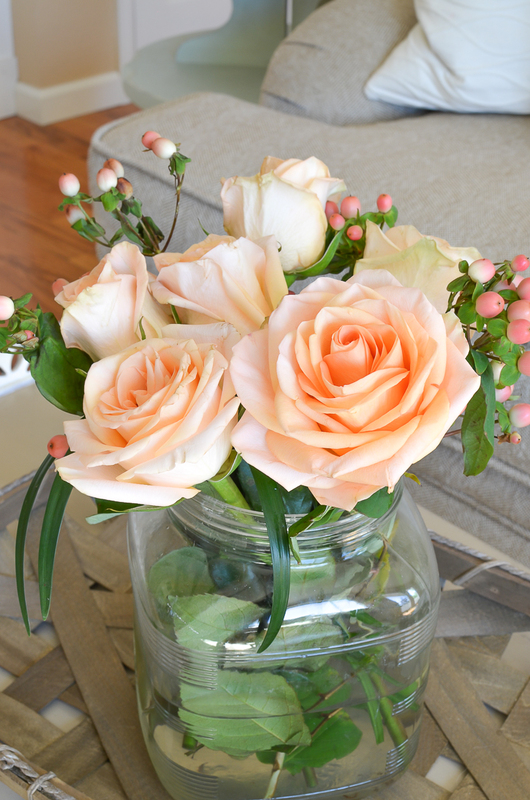 Also, if you don’t mind a tip, your fresh flowers will last way longer if you remove all the leaves from the stems before putting them in water! Thanks for the great post! Oh my goodness, still in school?! That’s crazy talk. I can’t imagine being in school this late into June. Thanks for the tip about the leaves on the flower stems–I had no idea! Your living room looks so cosy and inviting. Love every bit of it. 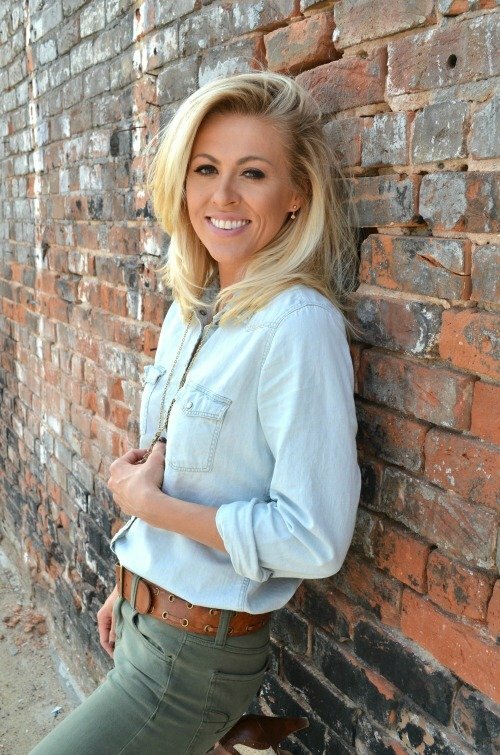 It’s Autumn Blonde by Sherwin Williams!